Many volunteers from London and abroad have been hard at work over the last couple of weeks, making sure that the main meditation hall in the London Diamond Way Buddhist centre is fit for the arrival of our Buddha statue. In order for us to create the best impressions in our minds, the hall should be as bright and beautiful as possible. 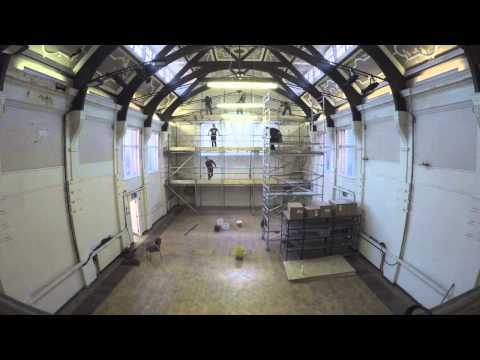 In this timelapse video, you can see many of these friends cleaning and renovating the back wall, where the statue will be placed once it is filled. At the end of the video, large shelves are erected and filled with mantra rolls, rolled in the Buddhist centre and given from many other Buddhist centres in different countries, as well as other statue-filling materials. To find out more, see the page about the Buddha statue. We would like to express our thanks to everyone who has helped and is helping in different ways in this project. Wow – amazing to see the progress we’ve made in just a few days!